Please Note: you will be renting the first floor of this vacation home. The square footage mentioned on this listing refers to that first floor and all pictures are also of the first floor. The owner has her stained glass art studio on the second floor, which has its own entrance. You are welcome to visit any time. Yellowstone Riverview Cabin was built in 2007. This tastefully furnished cabin is located only 9.5 miles (a mere 10 minute drive) from Yellowstone Park's original entrance in Gardiner, Montana. Riverview Cabin is the perfect place for fishing the Yellowstone River with several boat launch and public access sites in close proximity. This cabin is also ideal for naturalists, wildlife enthusiasts and photographers, because it is situated in Paradise Valley, a majestically beautiful wildlife corridor directly connected to Yellowstone Park. Bighorn sheep, deer and elk can be viewed regularly. The Great Room has a vaulted ceiling with panoramic windows to light the room with gorgeous views of Yankee Jim Canyon and the Yellowstone River. The happy hour wet bar, overstuffed furniture and custom stained glass wildlife panels are the perfect setting for relaxation after an adventurous day in our First National Park. There's room for eight at the dining room table next to a beautiful wildlife mural and comfy gas fireplace. The roll top desk is loaded with information, maps, guides and more on Yellowstone Country as well as a directory for booking raft trips, horseback rides, fishing trips etc. There are three bedrooms - one with a king size bed, the second with a queen and the third with two sets of bunks for the kids. The den has a comfy leather sofa and there is a flat screen HD satellite TV and lots of DVDs for all night movie enthusiasts! There is WiFi wireless internet connection for your electronic devices. The custom designed stone kitchen has everything you need to create a gourmet dinner, including olive oil, and herbs and spices for your use. You will enjoy the gorgeous custom stained glass sunflower valances, made by the owner. It also features a breakfast bar with seating and a breakfast table. There is an organic garden and guests are welcome to purchase fresh greens, veggies and tomatoes. Nature lovers, photographers, young and old will love being just minutes from the two million acre playground known as Yellowstone Park. 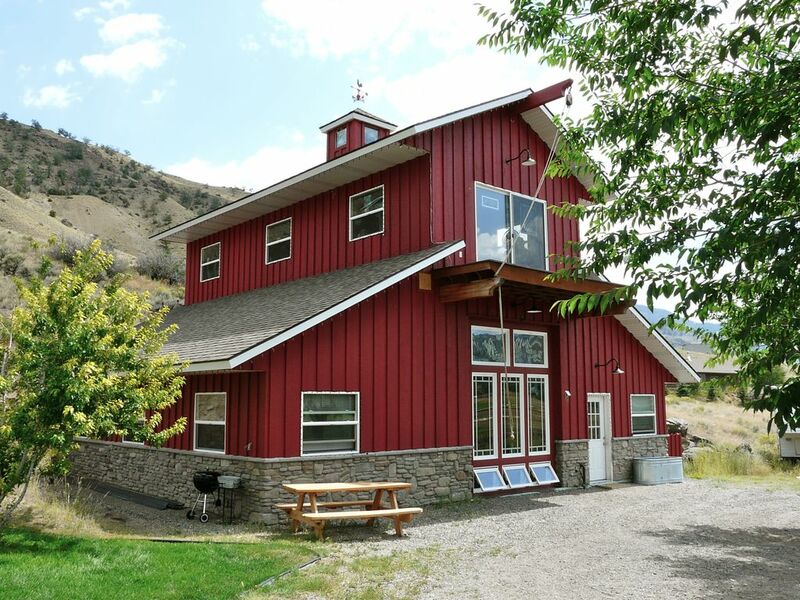 Whether it's horseback riding, whitewater rafting, hiking, geyser gazing or fishing the Yellowstone River and its many streams, creeks, lakes and ponds - you'll find it all right at your doorstep at Yellowstone Riverview Cabin! An added bonus is private stained glass lessons at the owner's studio for those rainy days! We supply our guests with lots of information, guide books, maps, trail guides and anything that you might need to make your vacation at our home a wonderful memory! This is a great place for a winter vacation, because it's close to Gardiner which is the only entrance to Yellowstone Park that is car-accessible year round. That plowed road remains open all winter all the way through to Tower Falls, the Lamar Valley and Cooke City. Many groomed trails for cross-country skiing are located along this road. Yellowstone Year Round Safaris offers guided snowmobile tours and snow coach tours into Yellowstone leaving from Best Western at Mammoth Hot Spring. Another fun winter activity is dog sledding at Absaroka Dogsled Treks which is available at Chico Hot Springs. If you love the rugged beauty of the Rocky Mountains and look forward to visiting Yellowstone Park with all of its natural beauty and wildlife, you're sure to enjoy your stay at Yellowstone Riverview Cabin! For 20 years John, our son Brady and I traveled from the Florida Keys to camp, hike, fish and explore Yellowstone Country. In 1998 we found the perfect spot and the three of us built our dream home and retreat. 12 years later we find Yellowstone as fascinating as it was on our first trip. We're still exploring this beautiful region finding new wilderness camping spots, blue ribbon lakes and streams and the magnificent wildlife of Yellowstone Country! Yellowstone Country is truly the 'last best place.' This remote area has more wildlife residents than human ones and learning about these critters and the land they share with us is an exciting journey few people take. It's gratifying to share our place with folks and see the wonderment in their eyes after they get up close and personal with wolves and bears or sit in a natural outdoor thermal pool in Yellowstone - there's nothing like it! Fantastic mountain views can be seen from the Great Room. Yellowstone Riverview Cabin looks out on the Yellowstone River which flows into beautiful Yankee Jim Canyon. As well as quilts, pillows, blankets etc. Wireless high speed internet has now been installed - just bring your electronic devices. The cabin has a gas stove and oven. Plenty of books and maps are at the cabin to plan your trip including a Yellowstone Expedition Guide. Board games and puzzles are in the armoir in the dining area. We have outdoor furniture and picnic table on the lawn by the gardens and under the shade tree - beautiful for summer outdoor BBQs. Only 9.5 miles to Yellowstone Park with all of its geothermal features and wildlife. This place was the perfect place for my party. It was roomy for my party of five we did not feel cramped at all, the view overlooking the river is great and the location where it's at is not to far from town so it's an easy trip in and to Yellowstone. The only problem we had we couldn't get the gas stove started. I do recommend this place if you looking for a quiet and peaceful place with a beautiful view of the mountain and river from the main room. And you wouldn't disappointed with the wildlife freely roaming all around you. Great place! Very clean and great view. Owners were great with us bringing our pets. Not all we thought it would be. It really needs to be advertised that you are not getting the entire home. When you view the site you see a two story home and I was excited about a room upstairs with a balcony. That is just an art studio. And the gas heater wouldn't light and it seemed to be a little of a bother that we called about it. Also when you say shampoo items are provided that doesn't mean a 3 oz bottle that is half empty. There are 3 people for almost a week. Other than that the place was spacious.. clean.. and a view to die for. The town is an awesome quaint place and we enjoyed ourselves. "Thank you for providing such a wonderful place to stay. We really enjoyed watching all the elk from the windows. Yellowstone was a dream come true for all our family." John and I are so happy you and your family enjoyed your visit to Yellowstone. We agree, it is wonderful to look out the window and see a beautiful herd of elk munching on the banks of the Yellowstone River - please come again! Near Gardiner, so perfect for park access. Bedrooms and living room is very nice, but maybe a second bathroom for group is a lack, the same for the dishwasher. We're an active mid-70s couple who just made our first visit to Yellowstone and the cabin was exactly what we wanted - far from the maddening crowds after a busy Yellowstone day. The North entrance to the park is much less traveled than the West entrance - we passed a mile long backup coming into the latter - and the cabin is only 15-20 minutes from that entrance thanks to favorable speed limits. Coming and going to the park, you pass Gardiner's Market which provided all the groceries that we needed. The cabin's owners, John and El Graff, and their friendly dogs, Jack and Sage, live next door which is helpful (we borrowed bear spray from them). The cabin is very comfortable and has all the equipment you need, but we wouldn't recommend more than four people because there's only one bathroom and only one sink in it. Possibly the strongest positive aspect of the cabin is its surroundings. From the mountains to the river the setting is fabulous. An elk herd regularly grazed across the river and only a mile north is the Cedar Creek Trail, part of Gallatin National Forest, which leads to a former dude ranch being restored by caring locals - it's a 2-3 mile walk into beautiful settings. We highly recommend staying in this unique place. Yellowstone National Park with all of its own geothermal features and abundant wildlife is only 9.5 miles from Yellowstone Riverview Cabin. Our favorite activity is to soak in the outdoor hot springs pool 12 miles from the cabin at Boiling River, just inside Yellowstone National Park and only 3 miles from Gardiner. Payments must be made by credit card via the HomeAway payment system.